Acidic vs Alkaline – How to combat a killer by eating your way through the war. Home health Acidic vs Alkaline – How to combat a killer by eating your way through the war. This post will hopefully help shed some light on how what we eat directly affects our well being and by learning how to eat the right foods you can personally take charge! This may seem like a fairly obvious idea, but after digging up all of the facts that make it a reality I quickly became angered at the blinders that have been securely fastened over my eyes for so many years. Dependent on the pH of the foods you eat you can cause or prevent disease, including cancer, along with all kinds of other ailments that may affect your daily life: anxiety, depression, thyroid issues, hormone imbalances, yeast overgrowth, immune malfunction, gout, weightgain/loss, etc. etc. 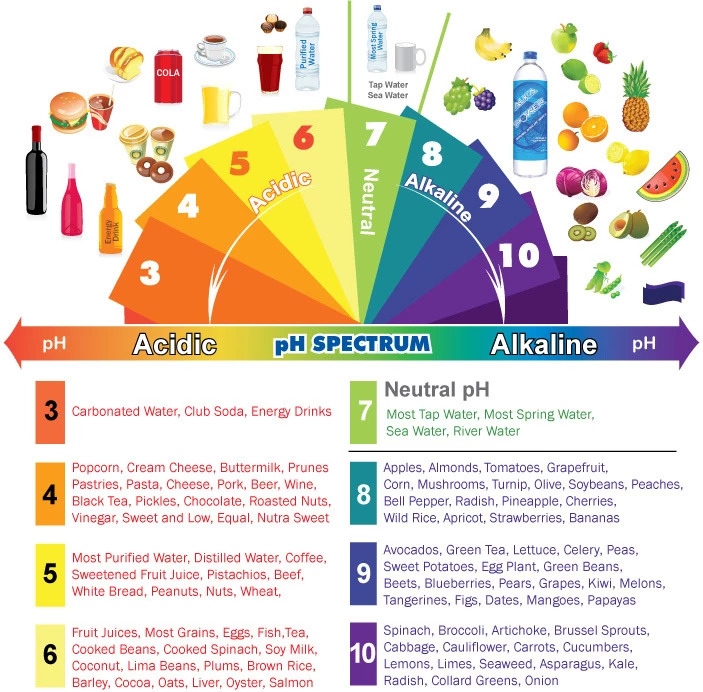 etc….. Here’s a cool little breakdown showing common foods and where they fall on the pH scale. Do yourself, your friends, and your family a favor by getting informed on this stuff and spreading the word. As much as they’d like us to believe it, we don’t have to depend on the Meat And Dairy Industry to get proper nutrition, contrarily, as this scale shows, their primary products are all in the acidic range! When our body is slightly alkaline we are virtually impervious to cancer and disease! This is stuff we need to know!!! You might ask: Why isn’t this information more readily available?… Well, consider the amount of power the meat and dairy industry have over media(think of the “Got Milk” campaign for instance) and then compound that by a million considering the power Big Pharma tacks onto that! These two industries are very much interested in keeping their consumers(the general public) quite unaware of just how dangerous and in cahoots they and their products are; And since both industries work hand in hand- the Meat and Dairy industry keeps you ill while Big Pharma sells you drugs to mask your illness and this goes on perpetually until you end up with cancer, diabetes, or the like, which Big Pharma and the western medical field treat with more expensive drugs that likely continue to mask your illness as well as drain ever my last cent from you eventually ending with your premature death. Diet can prevent and cure so much more then we’ve been told…It’s time to remove the veil my loves, a revolution is at hand and I want nothing more than for all you amazing humans to be at the forefront of making the change occur. In order to live long healthy happy lives we MUST seek out the truth and TAKE ACTION. Be the change my loves, it’s the only way.